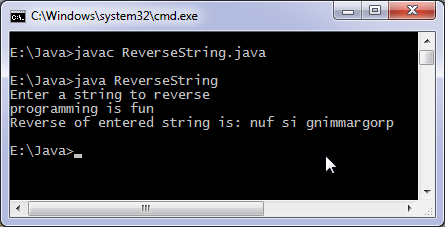 This java program reverses a string entered by the user. We use charAt method to extract characters from the string and append them in reverse order to reverse the entered string. StringBuffer class contains a method reverse which can be used to reverse or invert an object of this class. How to reverse a string using stack ? How to match regions in strings ? How to convert a string totally into upper case? How to split a string into a number of substrings ? How to search a word inside a string ? How to reverse a String? How to replace a substring inside a string by another one ? How to remove a particular character from a string? How to search last occurance of a substring inside a substring? How to compare two strings ?